Lubuntu is another Ubuntu derivative that aims to provide sufficient performance on old or low-powered hardware. 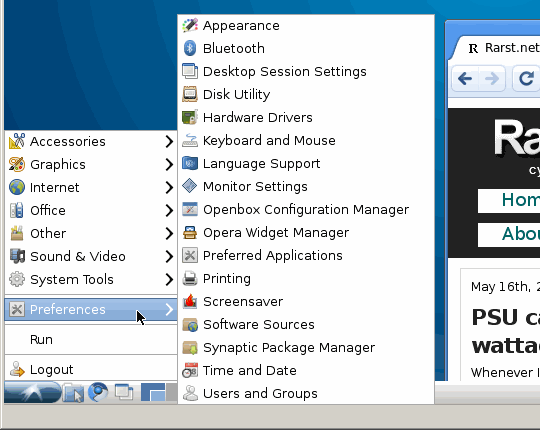 Lubuntu combines usual Ubuntu perks with lightweight LXDE desktop environment. It was initially available for installation on regular Ubuntu distributives, but at 10.04 also got first standalone stable beta release. It follows same principle in selection of default apps – there is only a handful with Chromium for browser. Visually it is minimalistic, the kind of interface that doesn’t get in your way. As for me strongest feature here is that Lubuntu doesn’t strive or pretend to be omnipotent OS. It is straightforward and non-confusing distributive that you can install in ~20 mins (what it took me on VM with slow 2.5” hard drive for disk container). And you get simple environment with decent browser and few light apps. Memory usage without any software running was reported to be 105MB. I’ve left it running in background for some time and noticed that one of randomly chosen screensavers completely trashes CPU. Weird behavior for energy-efficient claim. Another questionable decision is lack of automatic updates. As far as I understood Lubuntu won’t check for them despite that there is such setting where it should be. Wiki explains procedure for manual updates… But come one – who wants to remember updates on what is supposed to be old repurposed Internet box? Distributive with interesting and useful goal, but not without quirks in current state. I am most interested if it will become officially-endorsed derivative, which it aims to. I installed lubuntu on my asus eeepc 900hd, and it works like a charm! Installation was smooth, and I’ve been using this for the last two weeks without troubles. I don’t use the hibernate or screen savers functions; I start and shutdown as I need. I prefer that way to save on battery. However, because of the small screen I have, I think I’ll go back to ubuntu netbook remix, or even kubuntu netbook remix. I find it is faster that way to access apps. If Lubuntu does reach officially-endorsed status (or at least some traction on its own) it would be reasonable to expect future versions getting more polished for netbooks and such, after all its half of Lubuntu’s target hardware. Thanks for info! I will be sure to try that next time I play with Lubuntu. Just installed Lubuntu on a AMD K6 466mHz with 160 meg ram. Yes it uses 105 mb to load the desktop. This laptop shipped with win 98. Thanks to Lubuntu I can now print on my new Epson printer ( no drivers for win 98 ). It is completely stable. It does take a long time to install near the end, but really worth it. Also they use the stable branch. For old hardware this is excellent. This old laptop is now quite usable, and as a machine to lend to friends I wont have to worry about getting it back with viruses on it. I downloaded Firefox to have a more familiar browser. Thanks everyone for all the work you have put into this. Now that is some nostalgic hardware. I am very impressed that Lubuntu works fine on something that old, means they do accomplish their goal. Hi, I just got a T21 IBM it has a PIII with 800 MHZ and unfortunately only 256 MB RAM. However first I installed Ubuntu. The installation took abt. 1 hour and the operating system was running far away from beeing called stable. After that I thought allready of sending the used notebook back. Then I figured out abt lubuntu. The installation took abt 30 minutes. Now it runs fast like a charm. I even managed to install my huawai UMTS stick on it. Plus I have the advantages of the Ubuntu platform. The only disturbance is the missing update function. There is also no software manager so that you have to work with the command line in order to install additional software. And again I am impressed that modern OS manages to run fine on something that old. New Lubuntu version is planned for end of October. I didn’t look into details, but hope they will do something about updates. Really not a feature to be skipped. I believe you need to install DKMS before trying to install the VirtualBox Guest Additions software. When that completes, install the VirtualBox Guest Additions per instructions. Yep, I believe that solves it. Don’t remember if this was contributed on one of other posts (I probably mentioned guest addition issues couple of times) or I ended up googling it myself. Lubuntu failed to reach official status by autumn release and I didn’t spend much time with it since this post. It is interesting if it will make it official by next spring release. I’m trying to install it to an Asus EEEPC 4G, manually with the Lubuntu Alternate distribution, but I have to install everything from the CLI…teaches me to understand the Linux environment better, but progress is sloooowww….